No doubt, there are a lot of quilts around my house! 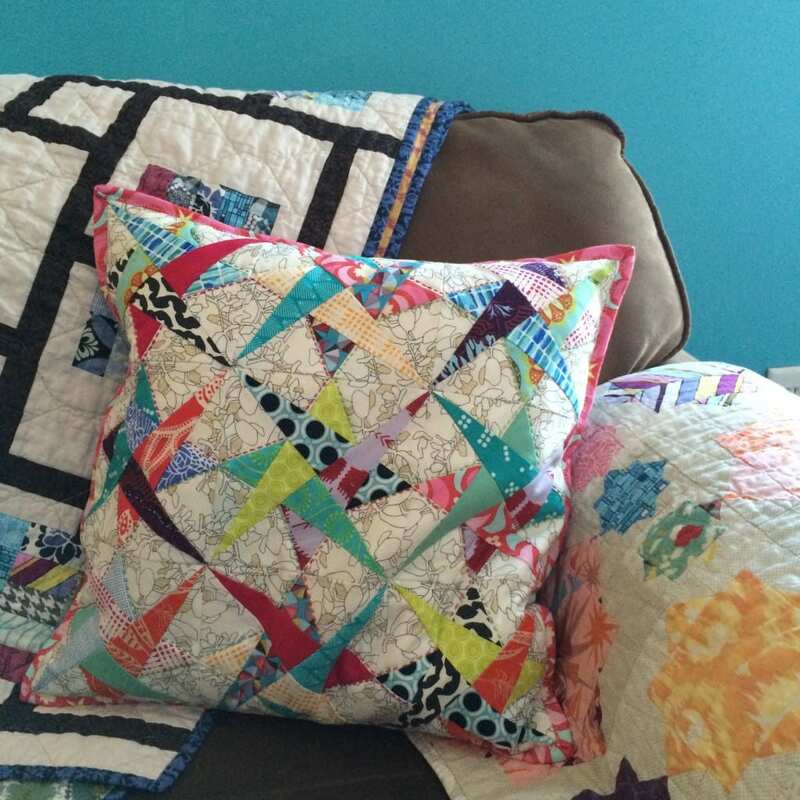 I love surrounding myself, and my family with the quilts I have loved making, and sometimes adding a pillow to the couch finishes the room off perfectly! This time of year, I’m always looking for more color to override the cold, bleak winter days. 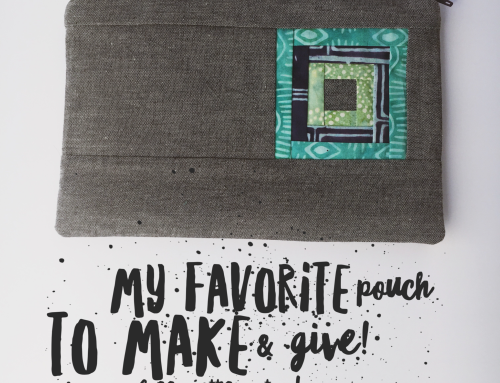 Recently, I sorted through my scraps and bundled them up so I could put them to better use, and decided that this pillow would be perfect for (some of) my scraps! 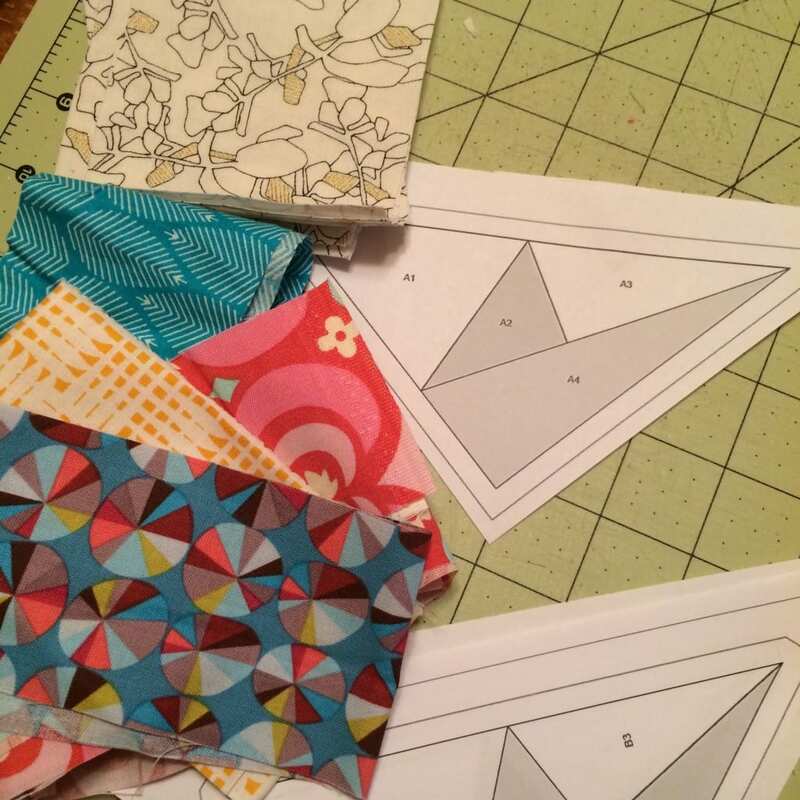 I love the precision that comes with paper piecing and odd-sized scraps are always great in paper patterns since I trim up after sewing. 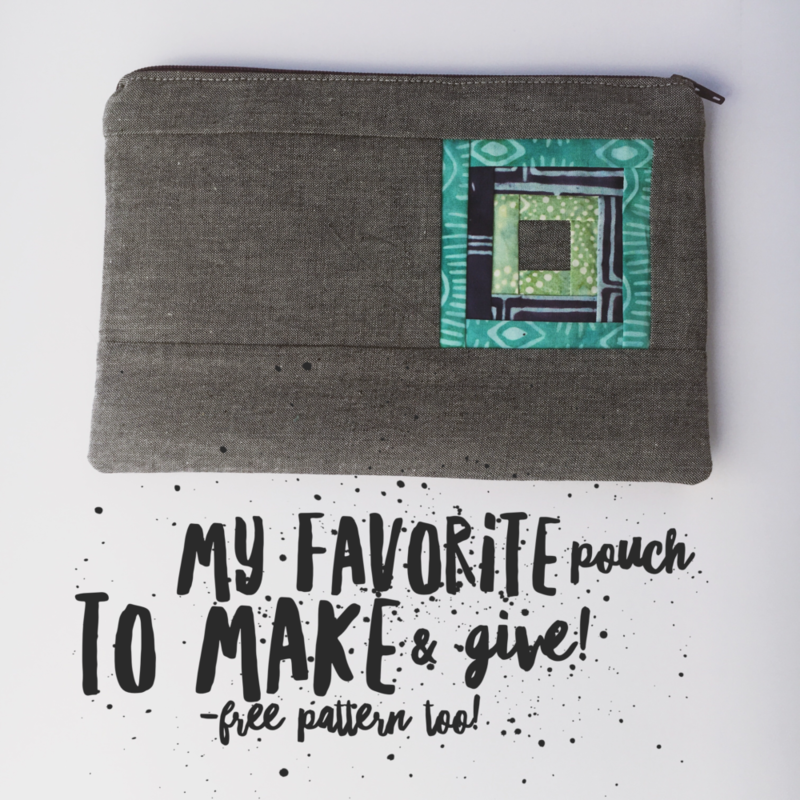 So I found this great pattern in EQ, pulled a group of fabrics from my stash, and sewed up nine unique and fun blocks for my pillow cover! Most of these pieces are less than a fat quarter, often just a few inches, but perfectly sized for the little wedges in the blocks. 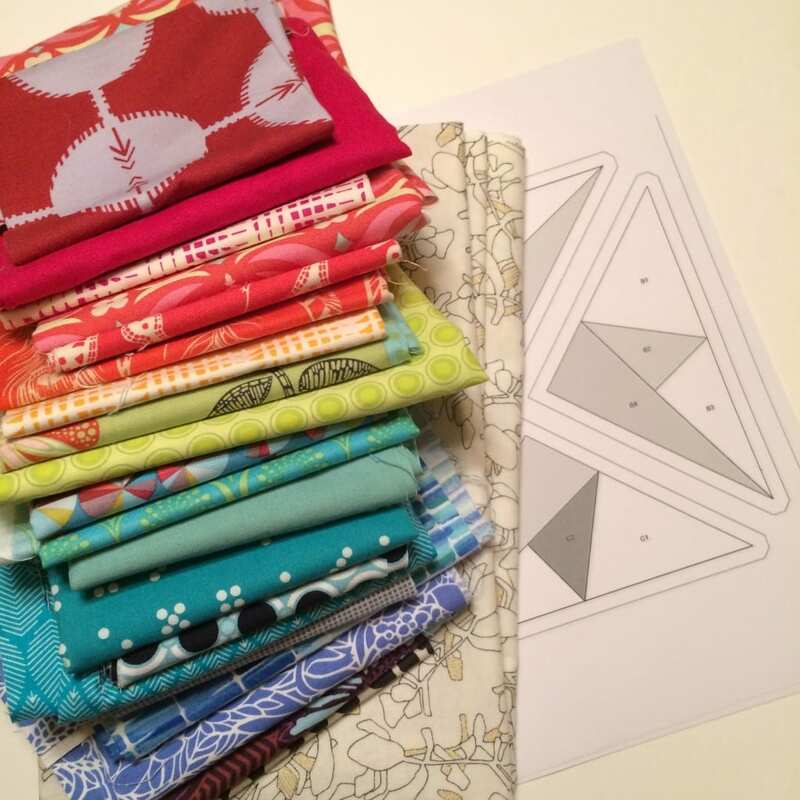 Along with 18-20 different scraps, gather 1/2 yard of background fabric, 19″x 19″ piece of batting and backing fabric, one 18″ – 22″ zipper, and roughly a 1/2 yard piece for the pillow back. 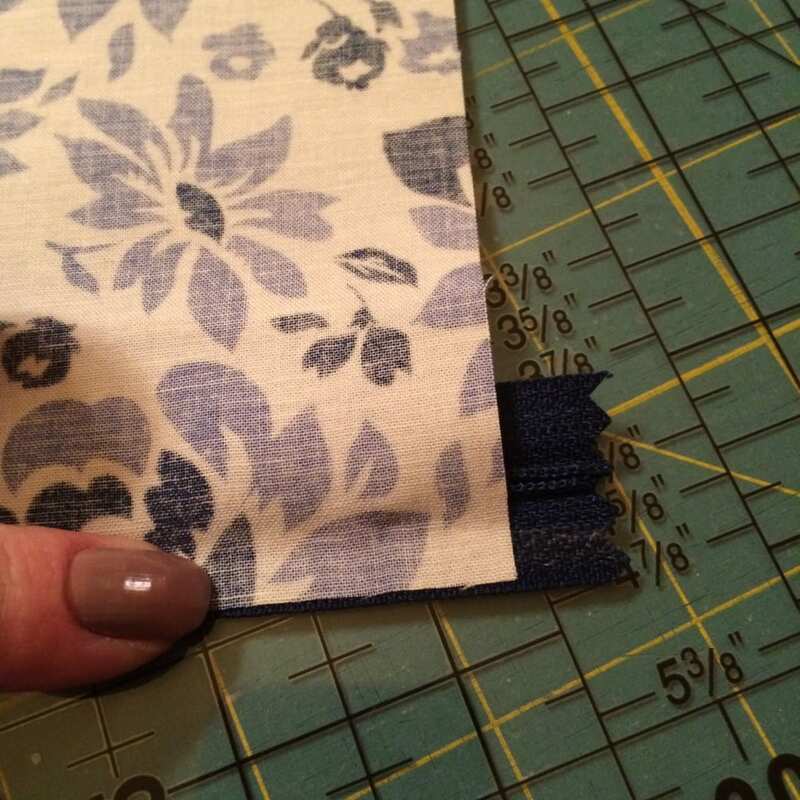 To get started, select four focal fabrics from your group for one block, and cut 2 1/2″ strips, if necessary, also cut six 3 1/2″ squares of background fabric. 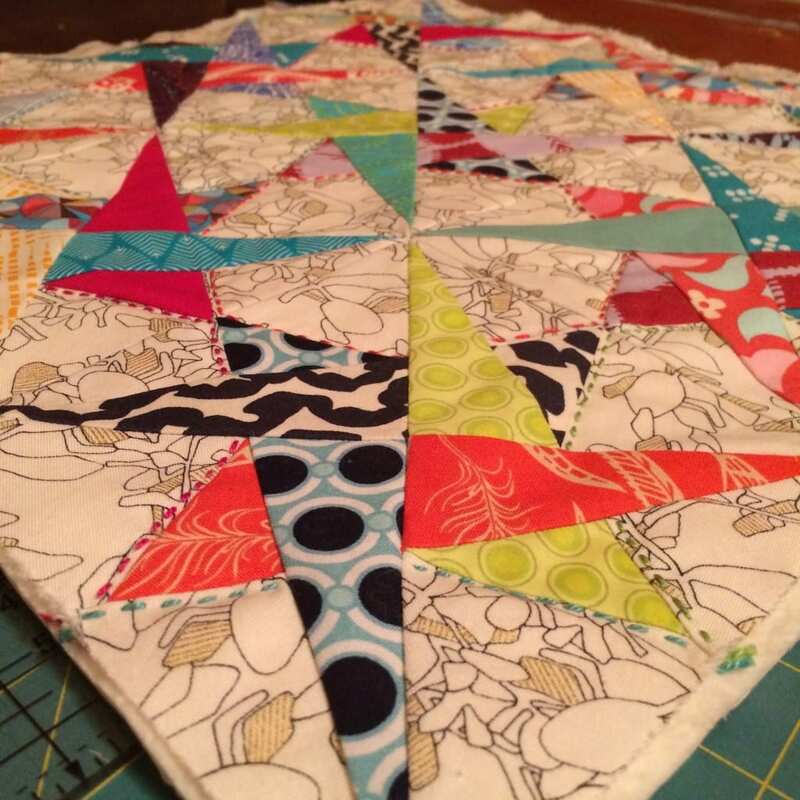 The thing to remember with paper piecing, is that the pattern you are looking at, is the back of your block, so as you work around your block it will be counterclockwise as you turn the pieces over, after sewing. 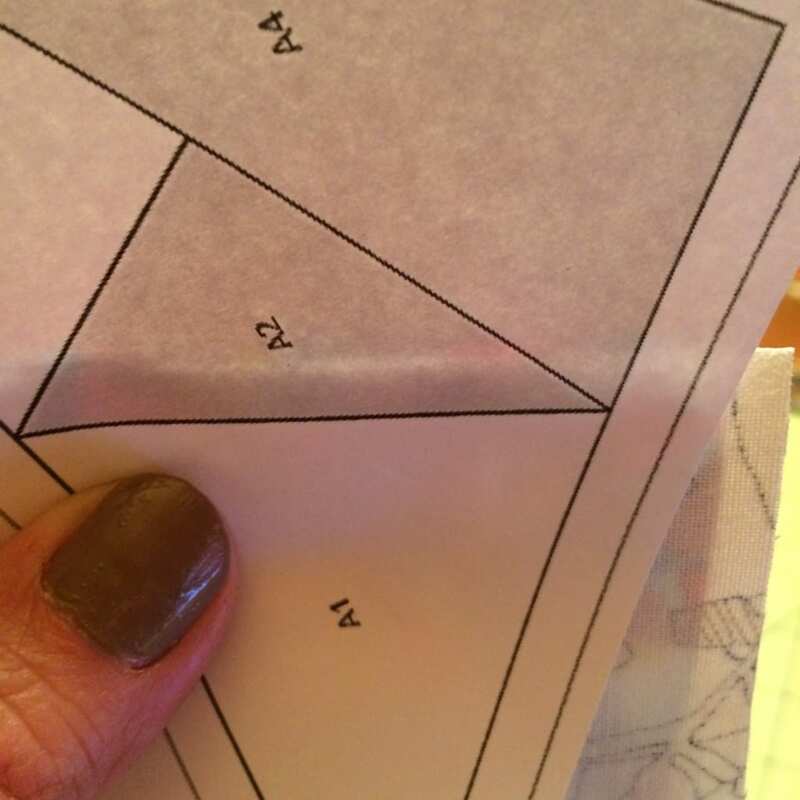 With the right side away from the paper, line up a background square, to cover the sewing line between A1 and A2, with 1/4″ seam allowance. Add the first focal fabric, again covering the sewing line. The pieces are so small, I mostly sewed with the whole strip, then trimmed after pressing so I was sure the A2 piece was covered. 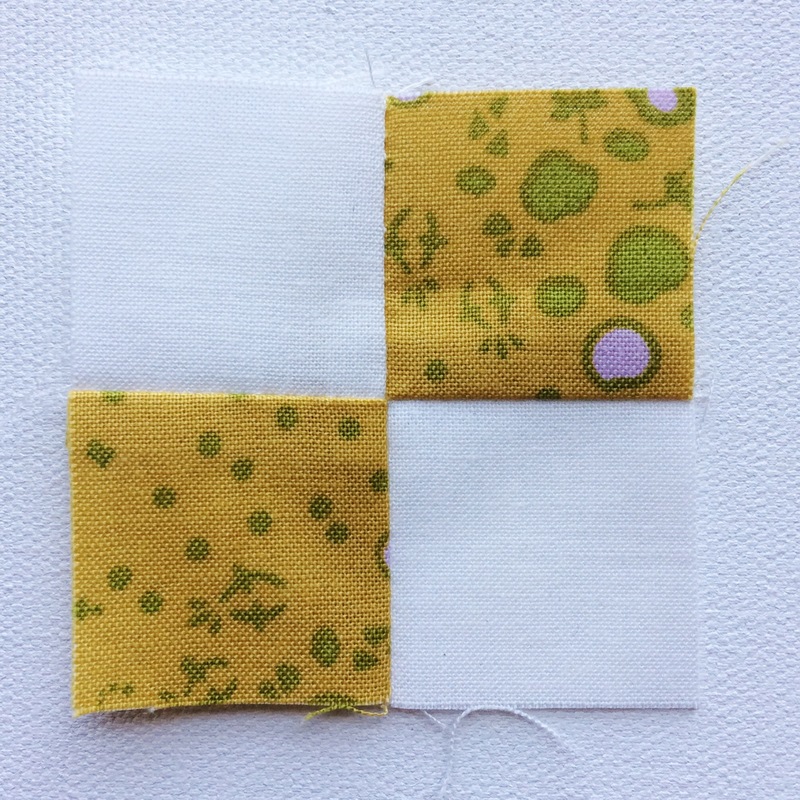 Add the second background piece, and then the second focal fabric, in the same manner, pressing and trimming away excess seam allowances between each addition. 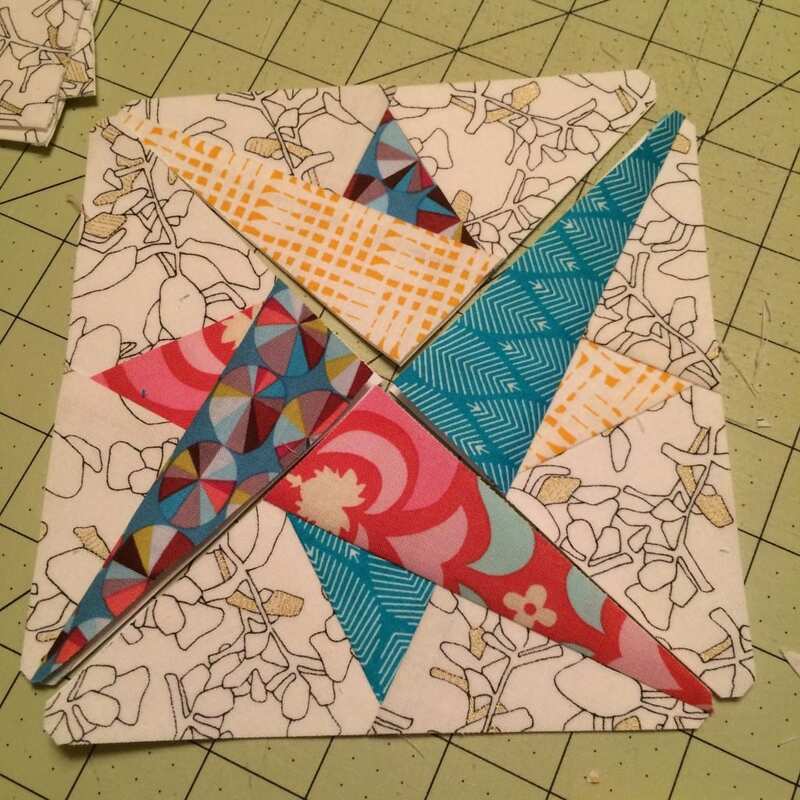 I was able to trim away the second background piece, and use it in the next quarter of the block – keep your scraps handy while piecing, they are often very useful! This Add-A-Quarter Ruler is super handy when paper piecing – the lip catches on the folded paper, offering a perfect 1/4″ seam allowance. 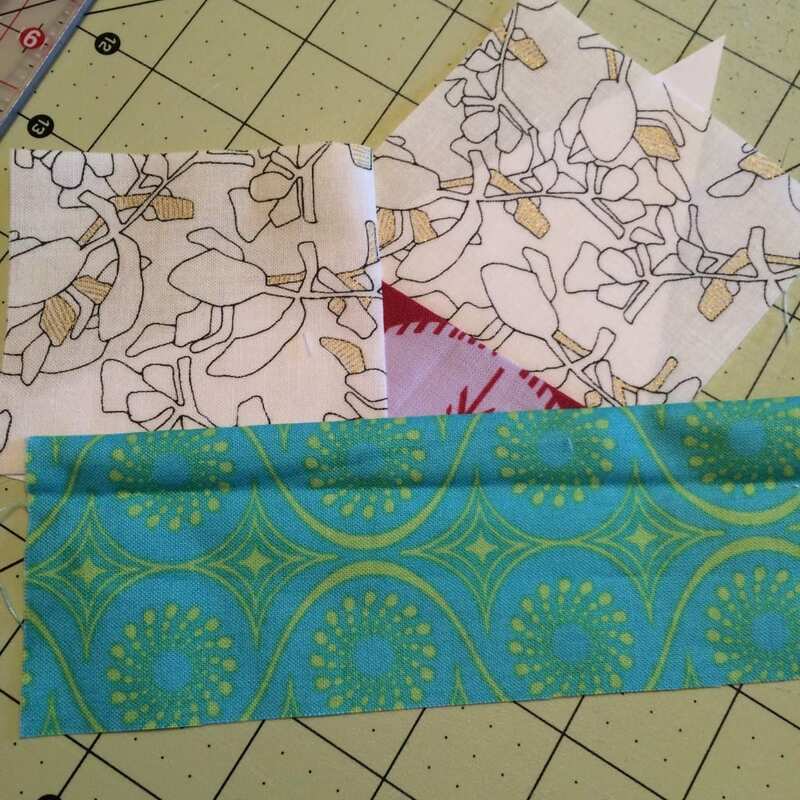 Work your way around the block adding the remaining focal fabrics as you work. 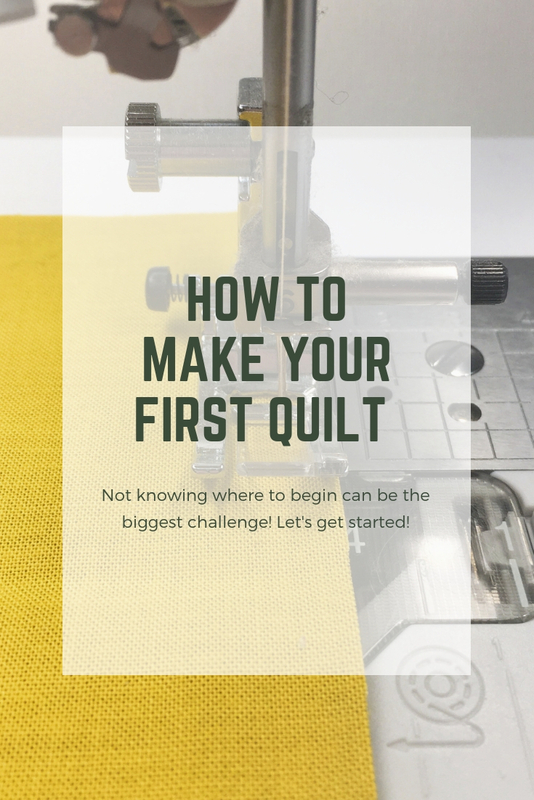 It’s a simple block once you get started – I promise! 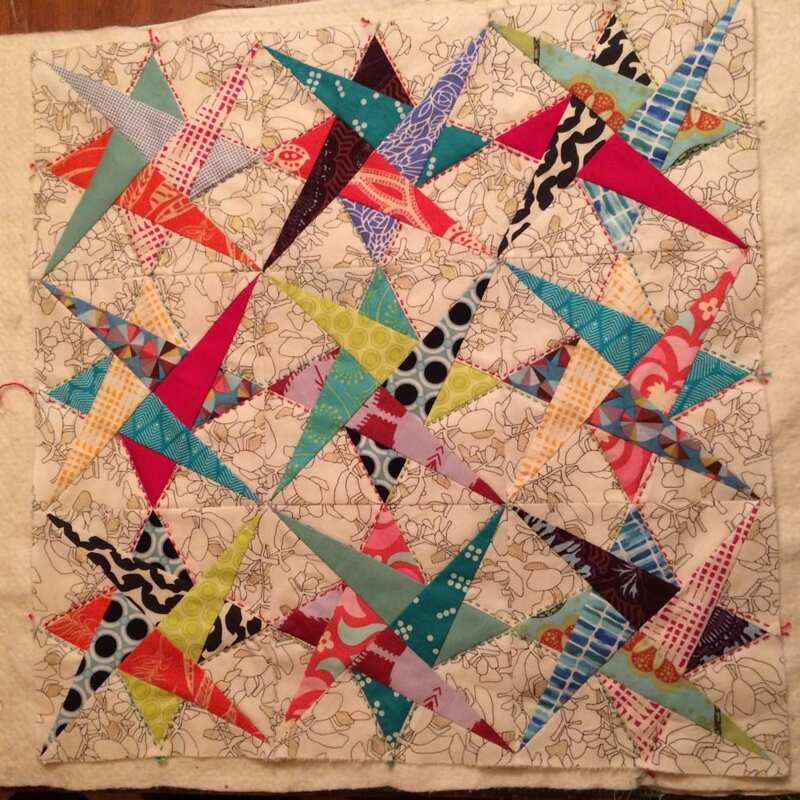 Layout nine blocks, and sew up the blocks into a sweet quilt top! 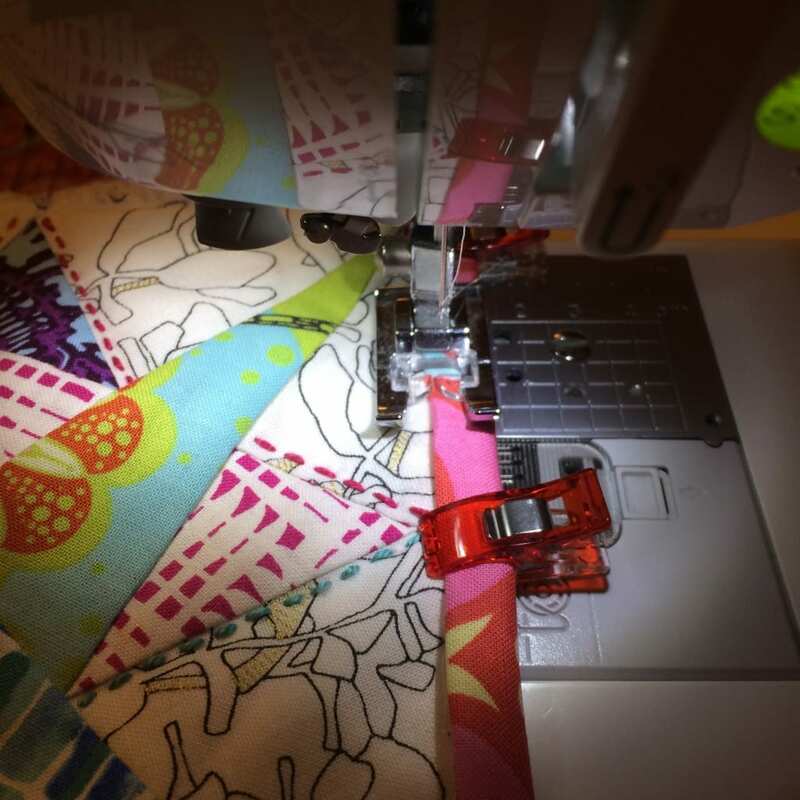 When paper piecing, I don’t like to use pins since it can warp the sewing line, and make the points miss each other. 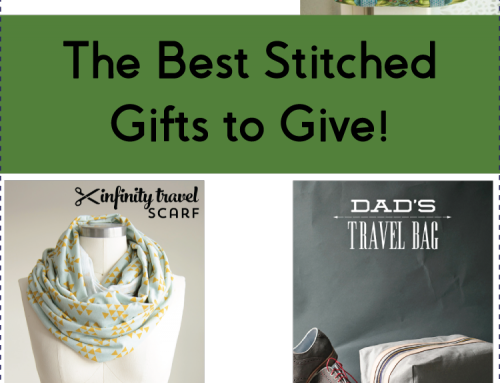 Stack the pieces together and sew them up – it works out! I opted to add a little hand-quilting, in negative space. 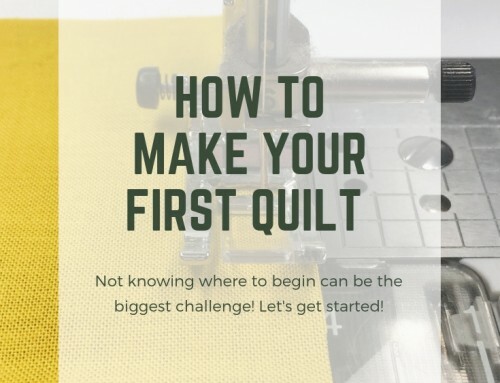 This size project is always quick to hand quilt, and it’s fun to do a little something different. I selected four perle cotton threads that coordinated with the scraps. Here you can see my stitches and where I put my knots, in the center I popped the knot into the batting by giving it a good tug. I prefer it on one side, to slip the pillow form in, and cut the fabric 15″ x 18 1/2″ and 4″ x 18 1/2″. 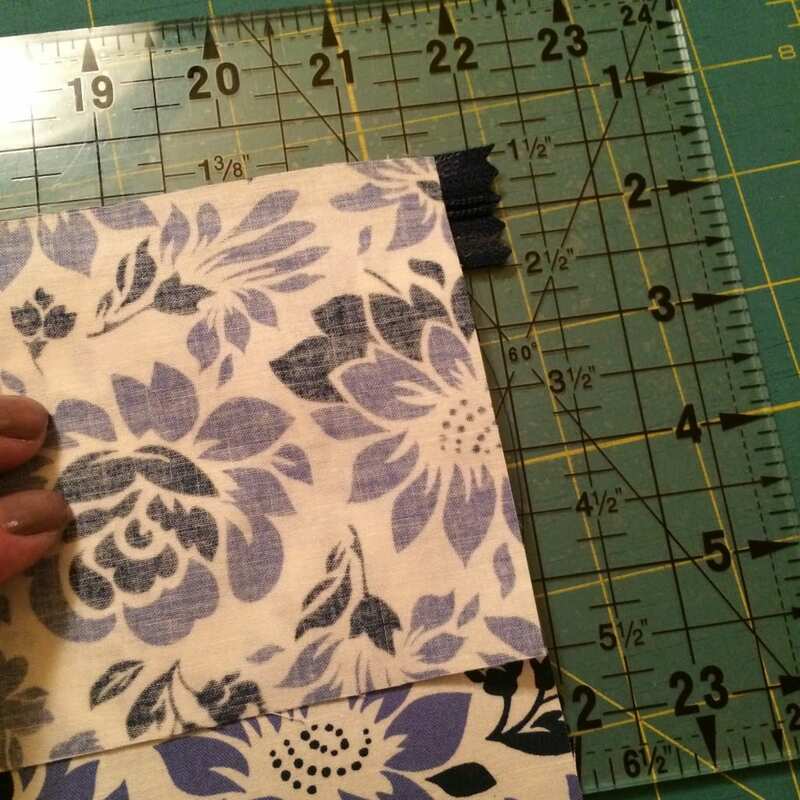 This can vary depending on how big a piece of fabric I have to work with, if I have 17″ I’ll use the whole width and cut a 2″ to match it up. Work with what you have! 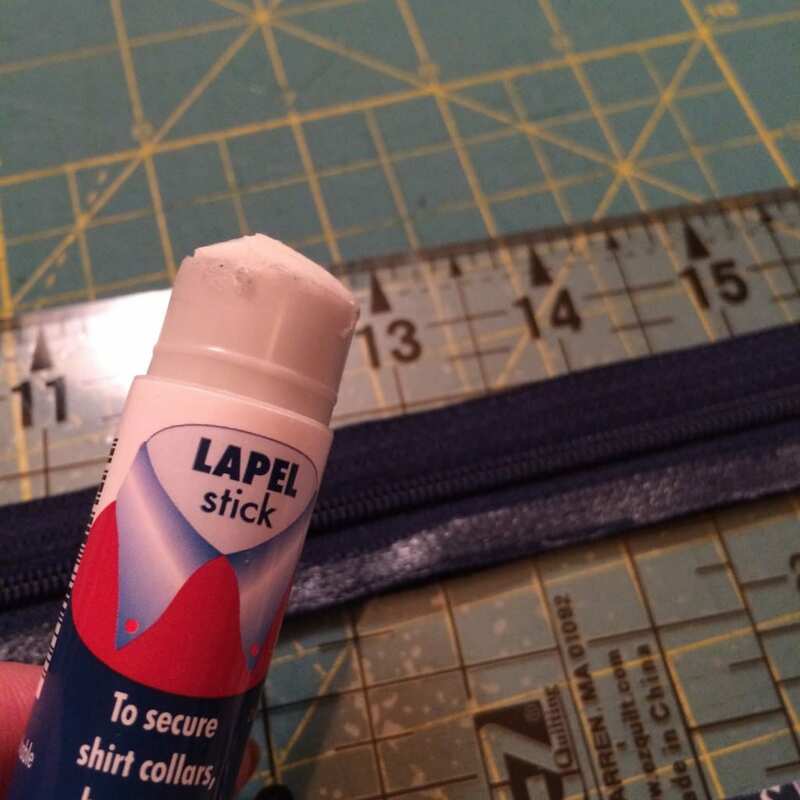 Add a strip of glue to one side of the zipper tape, and press the larger rectangle into the glue. Matching the raw edge with the edge of the zipper tape. Let the glue set for 2-3 minutes, to make sure the fabric doesn’t shift while sewing. 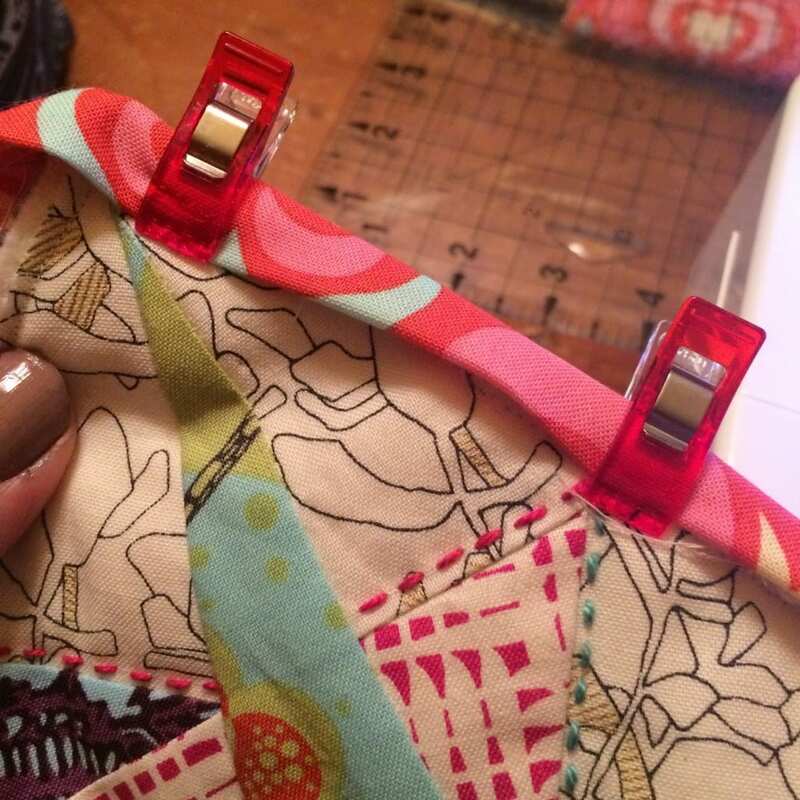 Attach your zipper foot while you wait, and coordinating thread, and sew along the edge of the zipper. 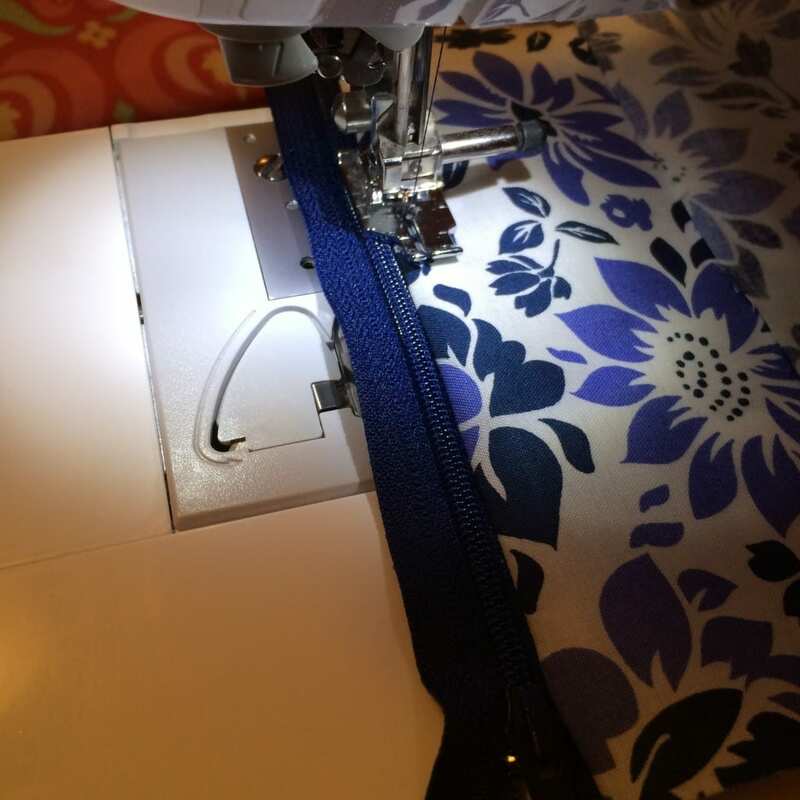 Sewing around the zipper pull is always a little sticky – I like to get the fabric sewn in place, then move the pull back 4-5″ so I can sew flush with the zipper teeth. All my zippers look like this, but you never see it from the outside! 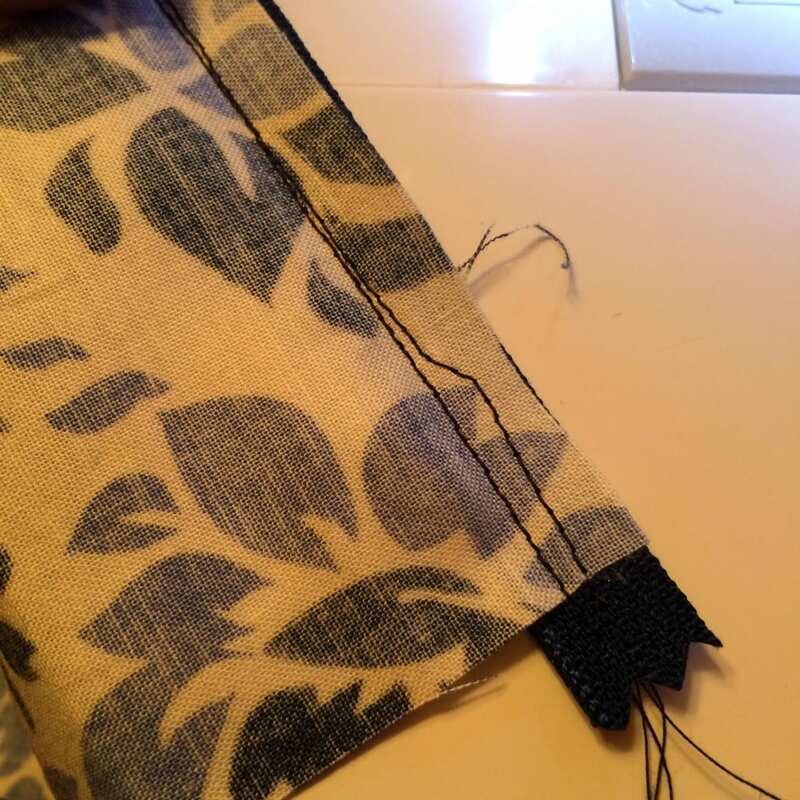 Press the fabric away from the zipper, and top stitch in place. Once again, I’ll stop and lift the foot, with the needle down, to move the zipper out of the way, so that I have a straight line of top stitching. This is my 1/4″ foot, but I like the skinny left side for top stitching. 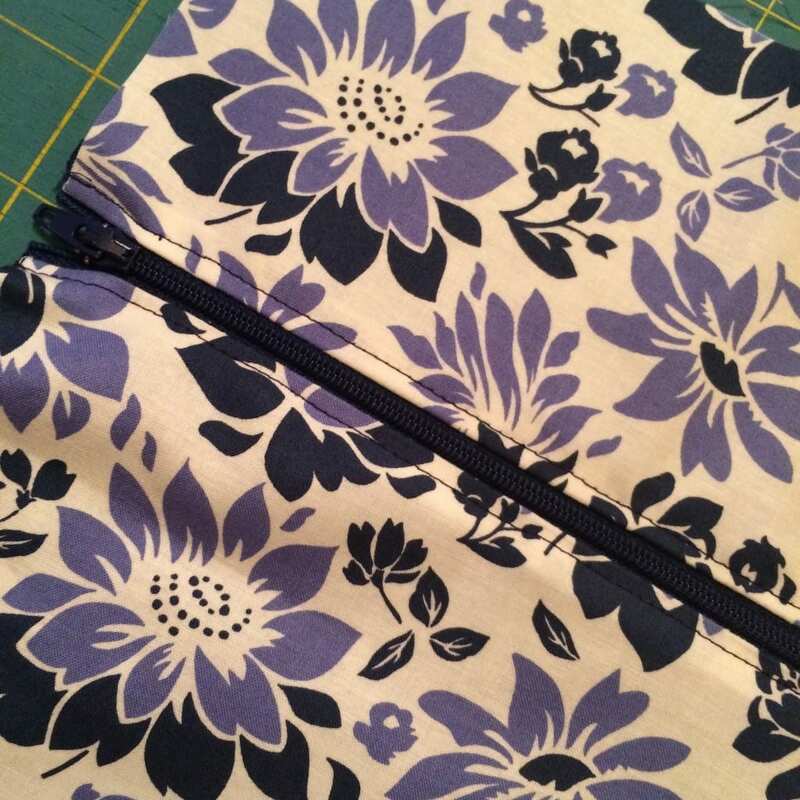 Add glue to the other side of the zipper tape, and repeat to fully install the zipper! 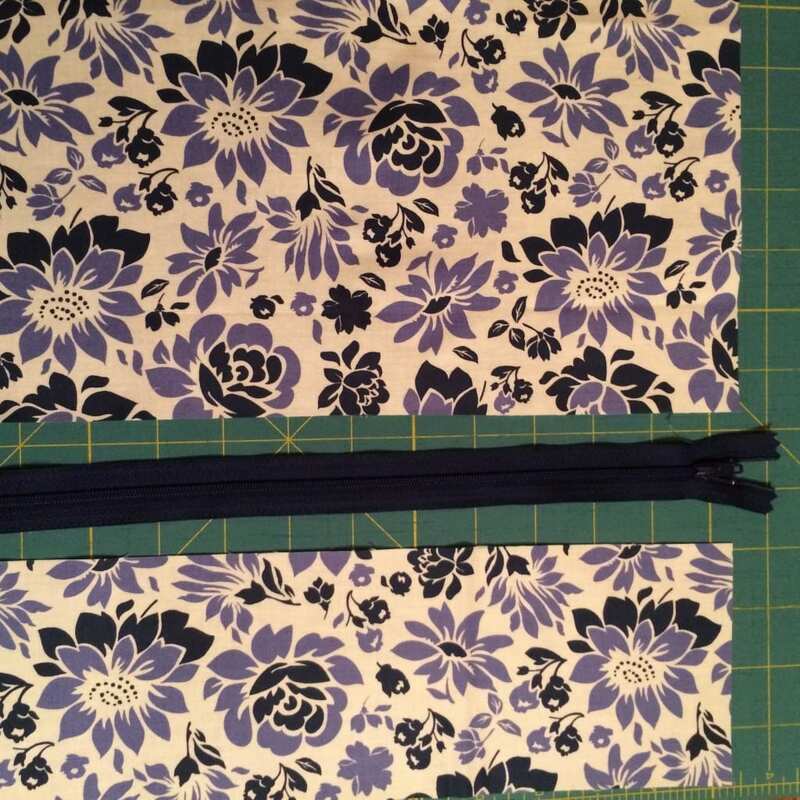 Trim the edges of the zipper tape away, and if you zipper is a lot long than your pillow back, tack the zipper shut in the seam allowance before trimming. 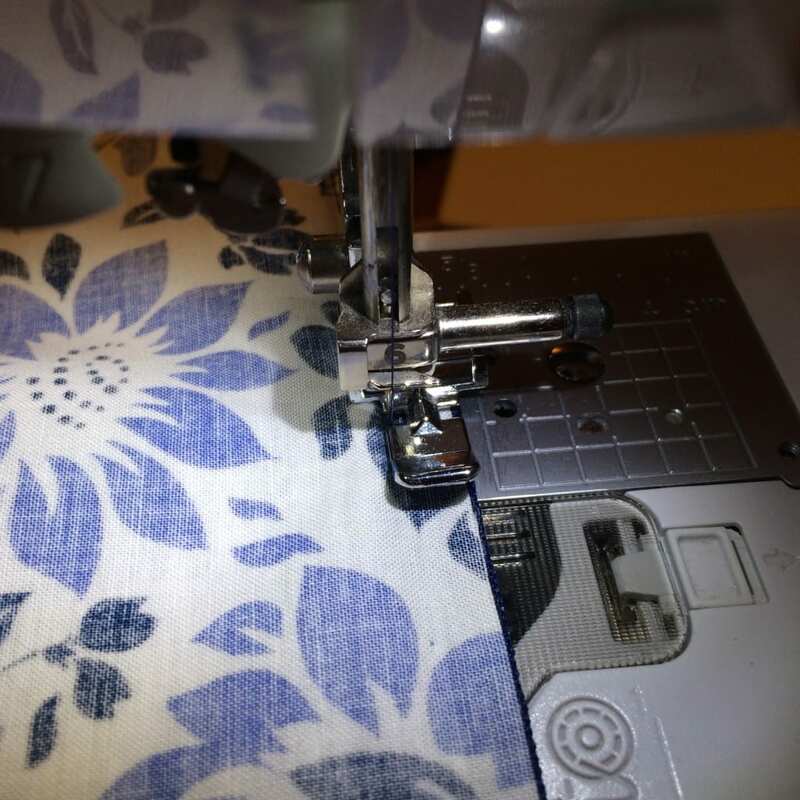 If you don’t have glue handy, install your zipper with pins, using a basting stitch to quickly position the zipper, then shorten the stitch length and sew it again. 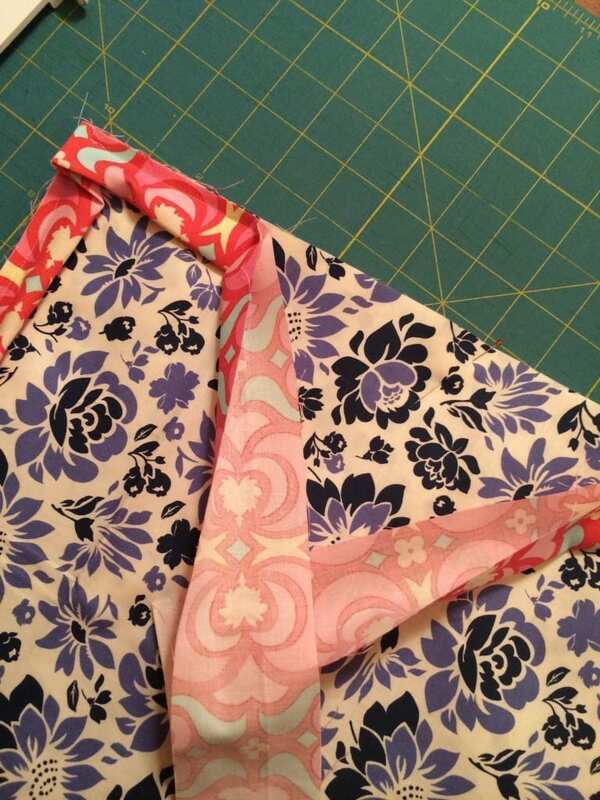 Cut two strips of fabric for binding 2 1/4″ x 40″, mitre the ends together as usual. Pin the back to the quilt back, and add the binding to the back. I like to use Wonder Clips to keep the binding pulled to the front, then use a blanket stitch to finish the binding on the front. It’s quick, and since I know this will need to be washed, more secure for multiple washings. It’s right at home with my other pieces on the couch – and always makes me smile! 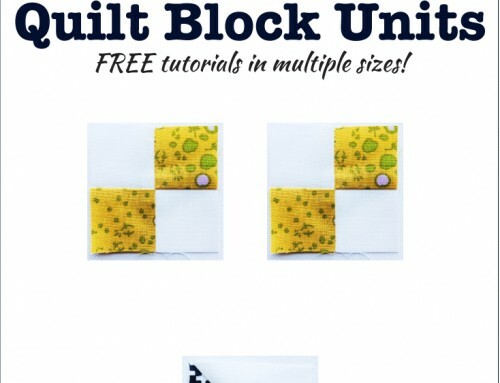 The block pattern can be downloaded right HERE. 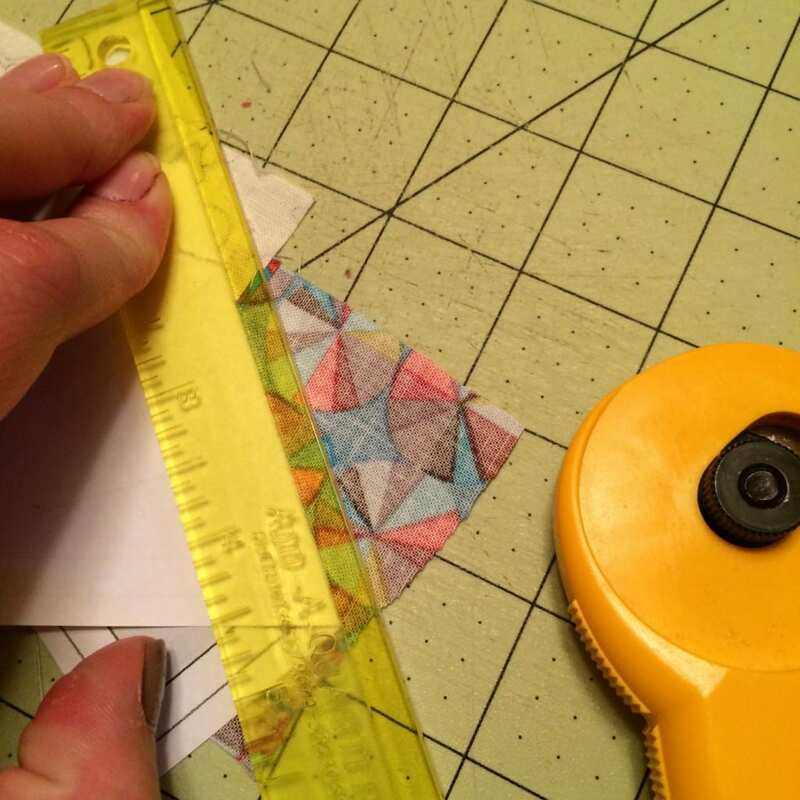 I also have a paper piecing video available here. 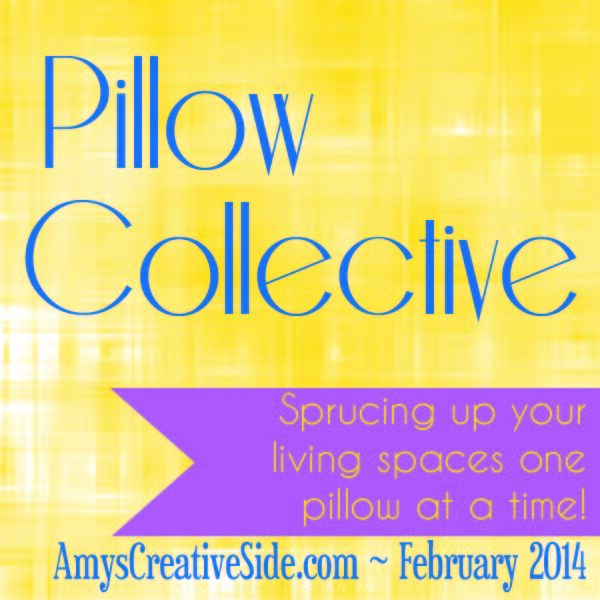 Learn more about Pillow Collective here. Be sure to check out the other tutorials available today by April and Lisa! And there’s more free tutorials coming all week long! Are you ready to get started? 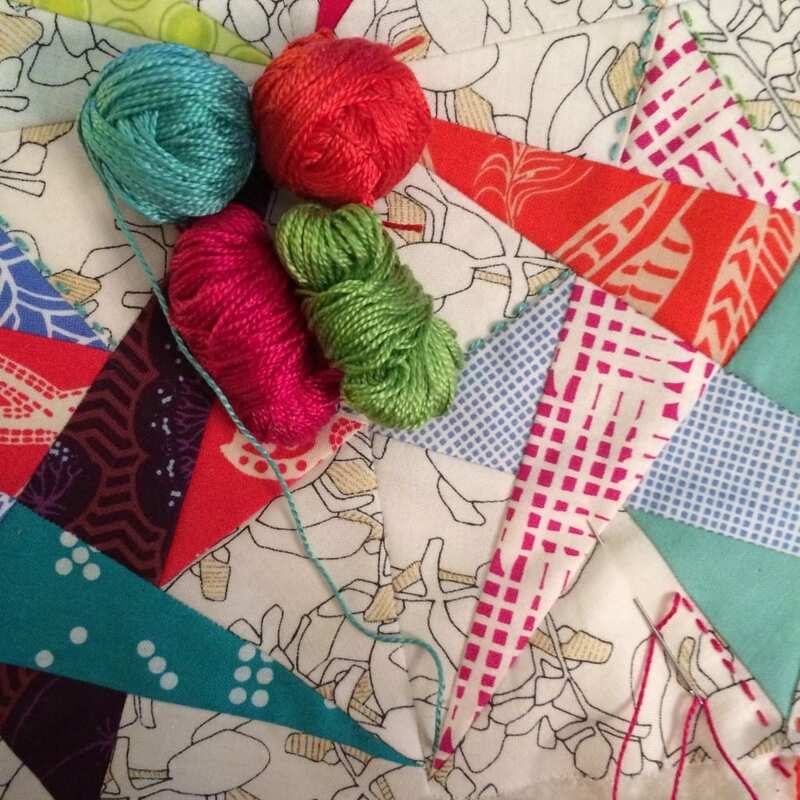 I can’t wait to see your versions of this fun project! Hi, thank you for this GREAT tutorial. 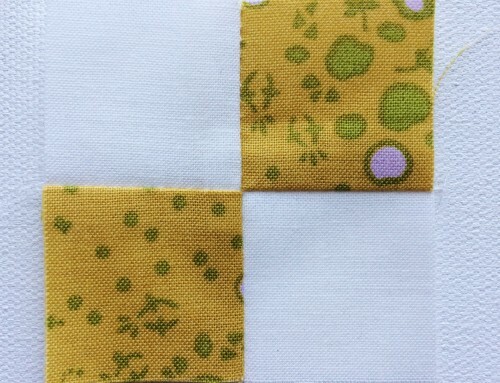 Just this morning, I decided to make a pillow for a bench in my office and this is a fun design. I went to print it and am wondering what scale you have set it to? It looks like the pillow ends up to be 18+ inches. Should we print this and blow it it? If so, what percent should we use? If you stated this and I missed it, I apologize but I do not see it. Awesome block and pillow! Love everything about it! I like to use paper clips to hold paper pieces together instead of pins. Just slide them off before the needle runs them over. The vinyl coated ones work best. Turn the heat off and allow the treats to cool thoroughly before removing. One could easily find these foods at Central Market. one gallon of liquid goat’s milk soap:.